US police are investigating the death of a UK woman after an alleged hotel room "buttocks-enhancement" procedure. Investigators say Claudia Adusei, 20, who had travelled from London died in hospital in Pennsylvania on Tuesday after an injection of silicone. 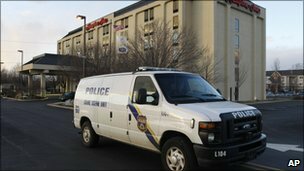 Detectives said the procedure, believed to have been arranged over the internet, took place at a hotel near Philadelphia International Airport. They are questioning a woman thought to have helped arrange the appointment. And police are pursuing a second woman who is believed to have performed the procedure. Lt Ray Evers said police executed a search warrant on Tuesday night at a home in Bergen County, New Jersey. The woman was questioned but was not under arrest, police said. Police said Ms Adusei, a British resident, and three companions were staying at a Hampton Inn hotel near the airport after travelling from London. Ms Adusei had the buttocks injection on Monday and a companion had a hip augmentation, AP reported. The medical examiner for Delaware County, Pennsylvania, had yet to release autopsy results, and further details of the procedure were unavailable. Silicone is used as a permanent filler in the body and is intended to create a rounded shape. Liquid silicone is not approved in the US for cosmetic injections and is banned in a host of other countries. Experts say a growing number of young women are seeking out procedures to enhance the shape of their buttocks. "Bottom augmentation is becoming more popular and originated in South America, in places like Brazil," said Paul Harris, plastic surgery consultant at the Royal Marsden hospital in London. Mr Harris added that though bottom augmentation procedures were becoming increasingly popular with women in the UK, liquid silicone injections were not practiced because of the risks associated with them. Anyone wishing to have a cosmetic procedure should check the credentials of the company and unit offering treatment, Mr Harris said. "Despite recent changes in regulation, there are still patients who take part in medical tourism and go outside the UK," he added. The body may attempt to ward off silicone when it is injected in small amounts, which can cause damage to surrounding tissue, Mr Harris said. "Elsewhere in the world it has been reported to cause problems with pulmonary embolism - a blood clot to the lungs - which may have happened in this most recent case," Mr Harris said.